Eddie Scrap-Iron Dupris: [Narrating] Only ever met one man I wouldn't wanna fight. When I met him he was already the best cut man in the business. Started training and managing in the sixties, but never lost his gift. Q: What happened to Frankie after he disappeared? Q: What does Mo Chúisle mean? Q: What did Frankie do to his daughter that he couldn't forgive himself for doing? Flawlessly written, acted and directed, MILLION DOLLAR BABY is being hymned and wreathed by the critics as the best film of 2004. They're absolutely right. "An old master's new masterpiece," the NEW YORK TIMES said in a review that was more of an open love letter to Eastwood than anything remotely resembling a critical analysis of the film itself. For once such honey-tongued critical adulation is fully merited. 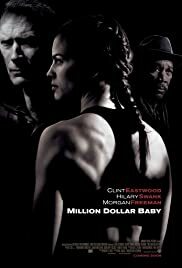 Dark, edgy, subtle and at times emotionally devastating, MILLION DOLLAR BABY represents the apotheosis of Eastwood's art - the most lucid and intelligently limned expression of his philosophy of the outsider, the noble loners whose personal codes of honour set them both above and apart from the compromised, corrupt societies they inhabit. The Boxing Ring As Metaphor For Life is a hoary trope almost as old as Hollywood itself, employed to varying effect in films as diverse as THE CHAMP, GOLDEN BOY, REQUIEM FOR A HEAVYWEIGHT, THE GREAT WHITE HOPE, FAT CITY, ROCKY and RAGING BULL. In MILLION DOLLAR BABY, though, Eastwood the director brings a fresh eye and an entirely fresh approach to both the setting and characterisations, virtually re-inventing this venerable sub-genre rather than simply recycling its conventions. Eastwood the actor is in fine form - a commanding if increasingly weather-beaten presence - as gym owner Frankie Dunn. A case study in loneliness, Dunn's creased face is a map of places you'd rather not go to and disappointment has clearly been a life-long companion. Co-stars Hilary Swank and the magnificent Morgan Freeman, playing Frankie's unlikely protegee Maggie Fitzgerald and friend "Scrap-Iron" Dupris, give what are without question the best performances of their respective careers: deftly underplayed, their roles provide emotionally overwhelming impacts more powerful than anything glimpsed in the film's riotous fight sequences. Forming an iron triangle forged from mutual dependence, Dunn and Dupris school the impulsive but untutored Maggie in both the techniques of boxing and the tradecraft of survival in a world pre-disposed to pulverise individualism. 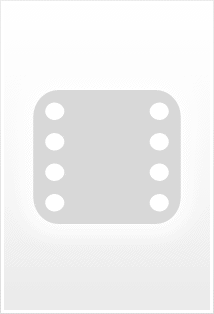 The canvas-floored square ring becomes the arena in which all three characters confront their various demons, battling for both victory and personal redemption. Paul Haggis' screenplay is itself a masterwork, improving on its source material without betraying the concise but compelling situations and superbly drawn characters found in F.X. Toole's short stories. And, finally, Eastwood the composer's elegiac but unobtrusive score is a minor classic of its kind, a requiem to both lost souls and lost causes. 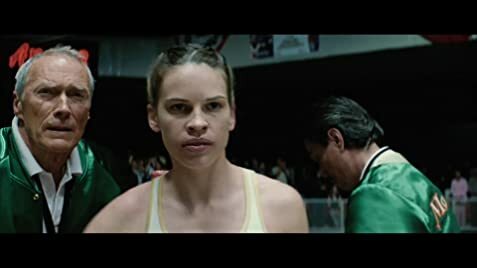 MILLION DOLLAR BABY is not only the best film released in 2004 it is also the most fully realised and richly textured major studio movie of the decade. 549 of 766 people found this review helpful. Was this review helpful to you?